Well, lamb week has moved along smoothly, and I even had a special guest(my brother, in town for work, came over for Part III). 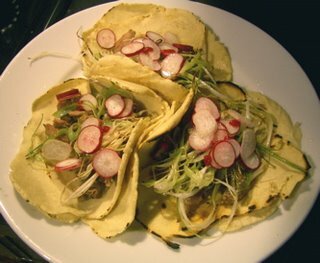 Leftover lamb, homemade corn tortillas, griddle-crisped spring garlic julienne, radishes, chili paste, lime. Plus a candy-cane beet salad with mint and mayonnaise. It had been almost two years since I made corn tortillas, and as you can tell by the picture I was a bit rusty. The texture and taste were good, but only the last couple were pretty. Oh well. The tacos were still awesome, especially the little bits of lamb fat. Leftover lamb, German Butterball potatoes, the last candy-cane beet(sob), shallots, dill, lots of salt and pepper. 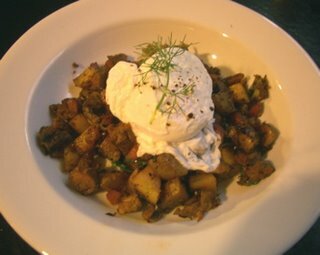 Topped with a poached egg, with foccacia and chestnut honey on the side. The hash was delicious, and this time I have my brother for a second opinion. Salty, sweet, rich from a little lamb fat. The dill added a nice springy brightness. A good start to the day. Part IV coming later today. Thanks for breakfast, J. That hash was phenomenal! and the foccacia, too- and I thought I was the bread expert.